Today’s games are listed below. We will update this post with any postponements or changes that we receive. #10 Oliver Ames @ #2 Dighton-Rehoboth – Postponed to Tuesday, 6/6 at 4:00. 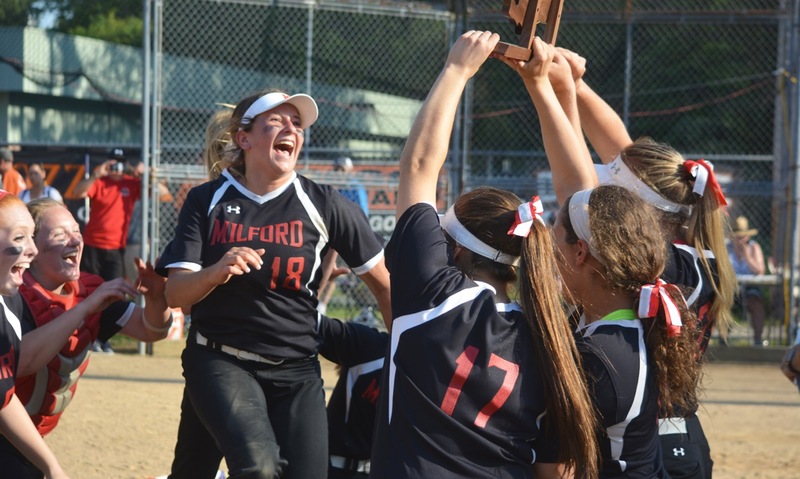 #2 Milford, 17 vs. #10 Norwood, 1 – Final (5 inn.) 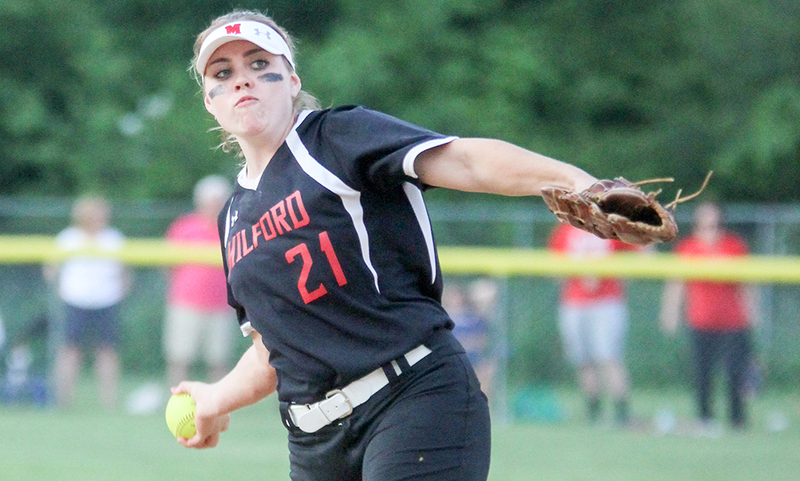 – Milford scored nine runs with two outs in the second inning, setting the tone in a blowout win over Norwood. After a pair of pop ups, Milford earned a walk, reached on back to back errors and walked again. Maggie Farrell (2-for-4, six RBI) launched a grand slam and the Scarlet Hawks followed with a double, a singe, a triple, a single and a double to stretch its lead to 10-1. Emily Piergustavo went 3-for-3 with three runs scored, a walk, a double and an RBI, Jess Tomaso had three hits, an RBI and two runs scored, Emily Hartman had two hits – a double and a triple – and drove in two runs and Maddy Bonvino was 2-for-2 with a double, a stolen base and two RBI. 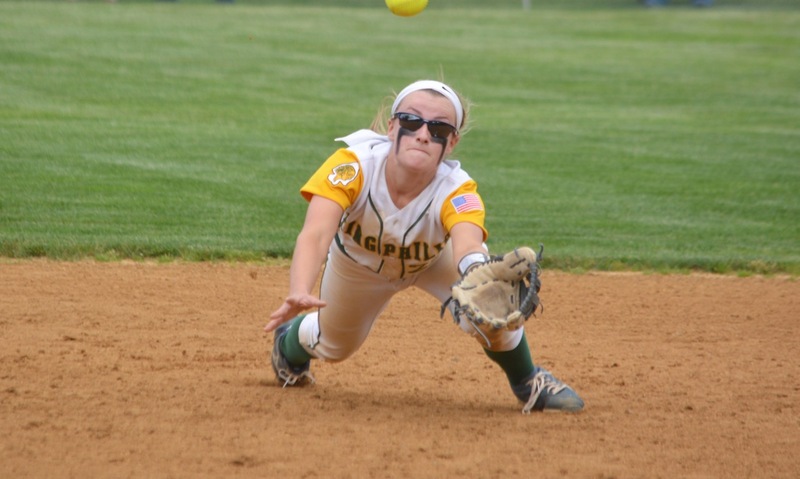 Ali Atherton stuck out six in four innings of work, scattering three hits with no earned runs allowed. #7 Franklin @ #2 Brookline – Postponed to Tuesday, 6/6 at a time and location to be announced. #7 North Attleboro @ #2 Wellesley – Postponed to Tuesday, 6/6 at 4:00. 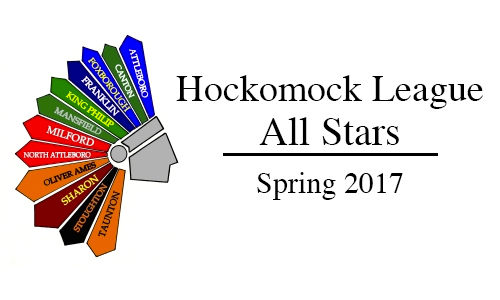 #8 Foxboro @ #1 Hingham – Postponed to Tuesday, 6/6 at 3:00 at The Weymouth Club. #13 Milford, 3 @ #4 Stoughton, 2 – Final (9 inn.) – Click here for a recap of this game. 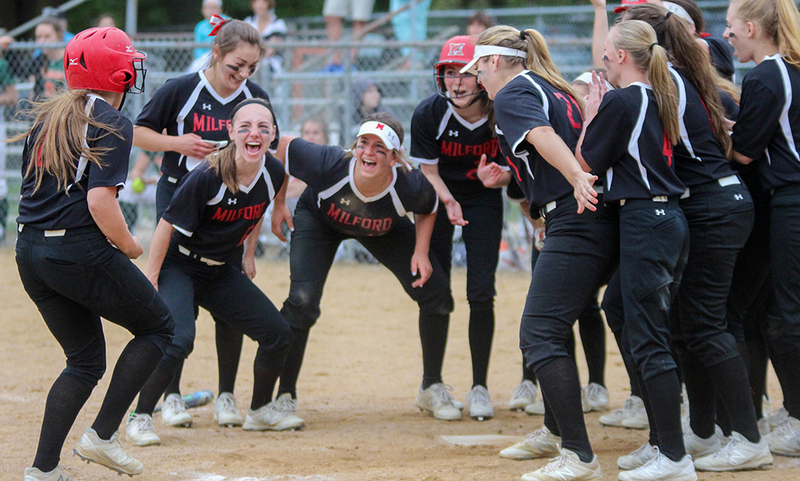 #2 Milford, 8 vs. #15 Plymouth North, 0 – Final – Milford needed just five hits to plate the five runs in the first inning as the Scarlet Hawks cruised to a big win in their first tournament game. Kate Irwin had three hits and scored a pair of runs while Maggie Farrell (double, two RBI) and Jess Tomaso (two doubles, three RBI) each had two hits for the Hawks. Maddie Bonvino (1-for-3) chipped in with two RBI. Ali Atherton allowed just three hits in six innings of work, striking out four. #23 Stoughton, 5 @ #10 Norwood, 6 – Final (8 inn.) – Stoughton pushed No. 10 seed Norwood to extra innings in their preliminary round game. The Black Knights nearly escaped a bases loaded jam in the bottom of the eighth after Norwood started the inning with a lead-off triple. Stoughton walked the next two batters and nearly turned a 1-2-3 double play, but with one out and a drawn-in outfield Erin Murphy lined a game-winning single to left for the Mustangs. Val Whalen, Alessandra Loffedo and Shannon Flaherty each had hits for the Black Knights and Krista Michienzi drove in a pair of runs. #17 Canton, 2 @ #16 Medway, 2 – Match suspended.